I think it’s cold here. I’m not sure because my digital thermometer quite recording outside temperature and I haven’t got around to finding the manual to reset it. The woman at the little store said it was -17F (-27C) a few days ago. This morning seemed cold because I couldn’t raise the temperature of the cabin past 45F(7C) and all the windows were iced over. I put the thermometer outside to see how cold it was, but after it was outside for awhile, it quite registering numbers…just figures that looked like L’s. I brought the thermometer back inside and now it doesn’t work at all. It’s just a blank screen. The little dog is back with it’s owners. She is smarter and stronger from her visit with me. My batteries for my solar system are failing fast. I don’t care. I think I would be able to use my laptop as long as the sun shines and when it doesn’t, I could still use it if I started the Honda generator, so no big deal. Update: This just in from tecno-wizard Laen Finehack. 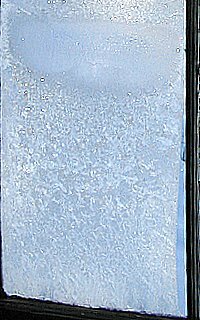 LCD screens can be destroyed by below freezing temperatures of -4F( -20C). So if ever you’re thinking, “I bet it’s really cold outside. Let me put my digital thermometer outside and see.�? Don’t. That includes your watch that tells the temperature.